The Öresund bridge between Sweden and Denmark is heading towards a new annual traffic record – but the number of regular train commuters has dropped in the past year. Around 6.9 million vehicles have crossed the bridge so far in 2016, with the sharpest increase this autumn. From August to November the total number of vehicles rose by 6.6 percent and the total number of cars by 6.7 percent. According to Øresundsbro Konsortiet, which manages the bridge, the increase is likely partly due to train travellers choosing to take the car or bus instead in order to avoid delays caused by the ID checks. 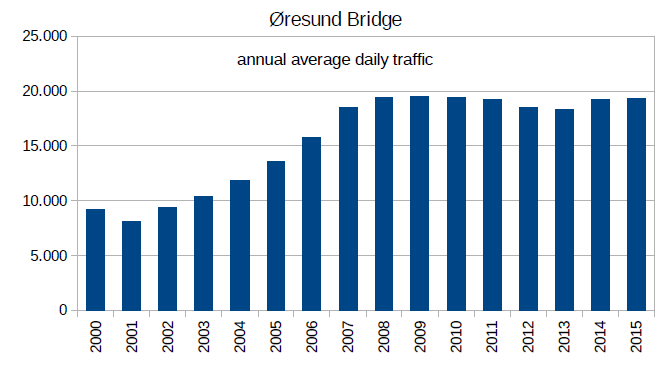 Øresund Bridge traffic growth has been sluggish since the start of the recession and a slow recovery. 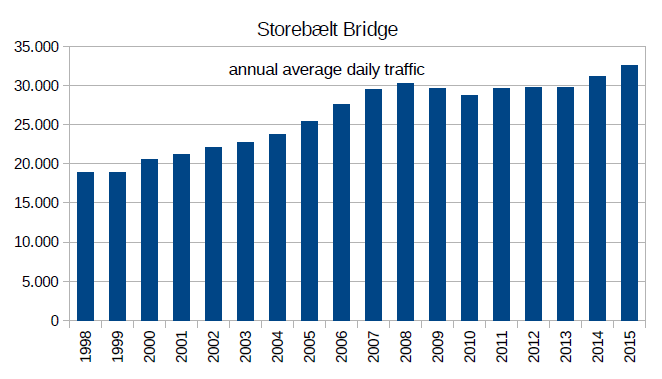 The Great Belt Bridge traffic growth has been more substantial.